River Plate Peacock Bass Peacock Bass Association with fishing trips to the Amazon for peacock bass anglers. Use Promo Code Larsout100 for additional 5% off. The tingle of adventure begins as your charter plane soars over the mystical Amazon rainforest. In secluded waters below awaits the world's most exciting freshwater fish — the explosive peacock bass -- and your River Plate Anglers Fly-in Floating Cabin camp. The fly-in floating camp is the best model for long-term fishing success in the Amazon. 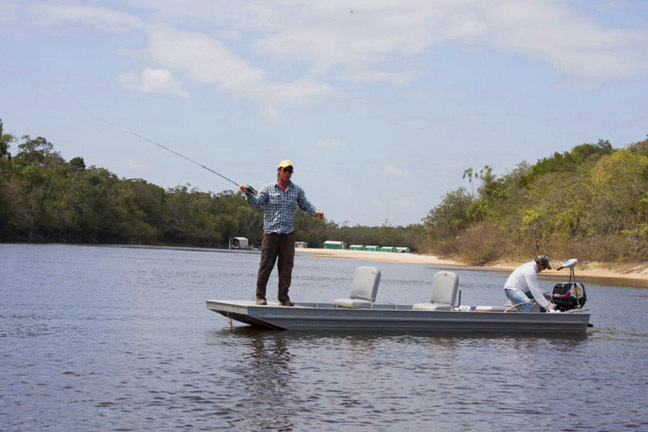 Its mobility is key to accessing remote fishing areas and adapting to river fluctuation, giving you the best chance for optimal fishing conditions. The floating cabins and shallow-draft boats can get past sandbars and other natural obstacles. Your guide will lead you to remote tributaries and lagoons inaccessible to others. It's not unusual to catch 15-30 peacocks a day, from three-pound butterflies to 20-pound monsters. And, as the camp can be easily moved 15-20 miles a day, you won't have to endure long runs to new fishing grounds -- a decided advantage over fixed-base lodges. 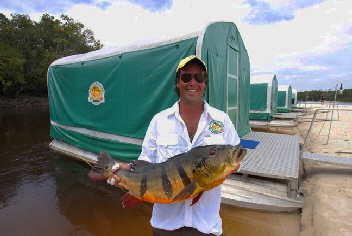 Our River Plate camp accommodates up to 8 anglers. Deluxe floating cabins are easily towed to new fishing areas , and securely beached in scenic jungle settings. Each roomy cabin has two comfortable beds, lighting, chairs, tables, private bathroom -- even an air conditioner. Manaus, Brazil. International airfare not included.